Captain Wayne Porter will present the first Wrigley Lecture Series of the 2012-2013 academic year. 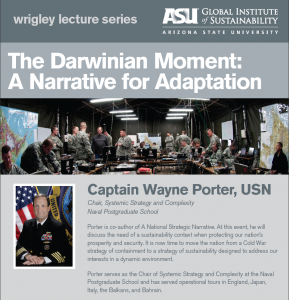 He will be discussing his piece, “A National Strategic Narrative,” co-authored with Colonel Mark Mykleby. The narrative argues for a need of a sustainability context when protecting our nation’s prosperity and security. It is now time to move the nation from a Cold War strategy of containment to a strategy of sustainability designed to address our enduring interests in a dynamic environment. Captain Porter has served operational tours in England, Japan, Italy, the Balkans, and Bahrain. His personal awards include the Ellis Island Medal of Honor, the Defense Superior Service Medal, three Legions of Merit, the Defense Meritorious Service Medal, the Navy Meritorious Service Medal, the NATO Meritorious Service Medal, and the Vice Admiral Rufus B. Taylor Award for Professional Excellence in Intelligence for his work in southern Serbia.